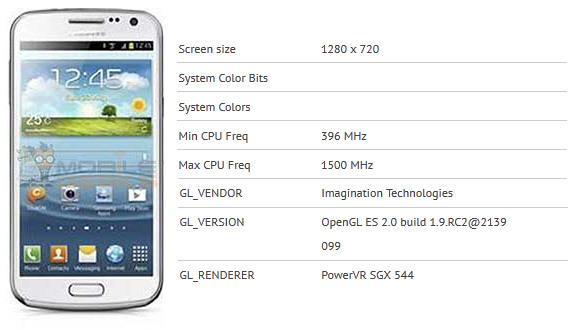 The Samsung I9260 Galaxy Premier was once rumored as the next Galaxy Nexus phone, but those rumors were renounced. The Premier sits somewhere between the Galaxy S III and the S III mini and now we know its GPU (and most likely chipset) thanks to a GLBenchmark score. GLBenchmark reports Android 4.1.1 Jelly Bean and 720p resolution (that's exactly 1280 x 720 pixels, which confirms there won't be on-screen controls). The CPU max frequency is listed as 1.5GHz and while the number of cores was left out, the rumors point to a dual-core processor. The GPU is a PowerVR SGX 544, very similar to the SGX543 found in Apple's latest chipsets. All of this - plus some AnTuTu scores from last week - point to a TI OMAP 4470 chipset (recently used in Amazon's Kindle Fire HD 8.9 tablet). This means the I9260 Galaxy Premier has two Cortex-A9 cores, probably 1GB of RAM and the SGX544 GPU. Other Android chipset makers rely on Mali (Samsung's Exynos), GeForce (Tegra) or Adreno (Qualcomm), which leave Texas Instruments. We know it's not a Cortex-A15 packing OMAP 5 chipset (which has a dual-core CPU and SGX544 too), because the AnTuTu CPU scores are below those of the HTC One S and its two Krait cores. Anyway, the Galaxy Premier is not going to dethrone the Galaxy S III, but it does look more temtping than the NovaThor-packing Galaxy S III mini. We're still waiting for the Samsung I9260 Galaxy Premier to be officially announced. First do some Research, before you comment on anything..
well , nice specs for a med-range device .I hope it has 2 gigs of ram .